While visiting New Jersey Dennis Gage takes a moment to enjoy Andy Wickenheisser’s latest gasser creation dubbed “Gas Bubble”. Andy’s 60s flavored custom borrows styling themes from gasser drag cars of the period as well as the bubble roof design popular on the 60s show car circuit with famous rides by Big Daddy Ed Roth and Darryl Starbird. Based on a 1963 Plymouth Fury, Andy’s gasser creation includes: Removing the entire roof and replacing it with a huge blown Lexan bubble, Passing the exhaust stacks right through the hood, Straight axle front suspension, 383ci engine and 60’s styled custom paint. Together these modifications create a one-of-a-kind dream ride. Dennis learns the principles of the “Green House Effect” as he talks Andy into a test drive of “Gas Bubble”. For most classic cars, an air dam is used to help the car breathe better, but Mark Oja uses one on his GT 500 to make it look even cooler. Whatever your purpose, this video will teach you how to install an air dam into a classic car. You’re probably well aware that hearing a “clunk” sound when shifting your car into gear is never good, but did you know that it typically means you may need a U-Joint replacement? 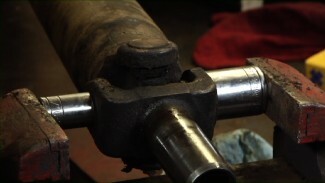 Brent Ackley discusses the bearings that are causing this problem and shows how to replace them.